One of my fellow bloggers ACoEst1984 also sells jewelry that she makes herself on Etsy.com. 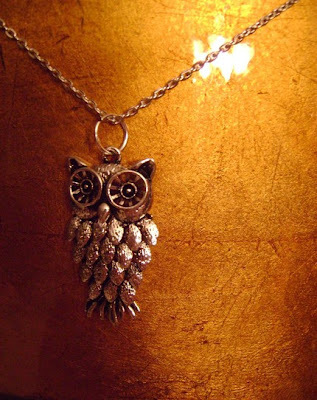 I fell in love with this Night Owl Necklace as soon as I saw it. There is something so fun and unique about the owl pendant. I think unique and large pendants are a great way to had fun and interest to your looks. I would wear this with jeans and tee for a casual look. Also, She is giving away a Lucky Key Necklace from her Etsy.com shop! Go to her blog ACoEst1984 to enter the giveaway. Amazing! I love it...and it's only $15? SUH-WEET. thanks for the giveaway link. i love this. I love the romance of necklaces. I think it's adorable. Love her jewelry! OMG it's beautiful! I want it, xD. It reminds me a lot of something i've seen at forever 21. I love Owl pendants and am looking for a large one for myself. I love it, my god you are so talented, i like the way you made the eyes, they are very impressive, i you deal with personalized long pendants like i can have a small message engraved on it like these pendants i came across then i would like your skillful hands make me one.